I hardly got any time to get into the printshop during 2016, so took an opportunity to dive right back in over the Christmas holidays. 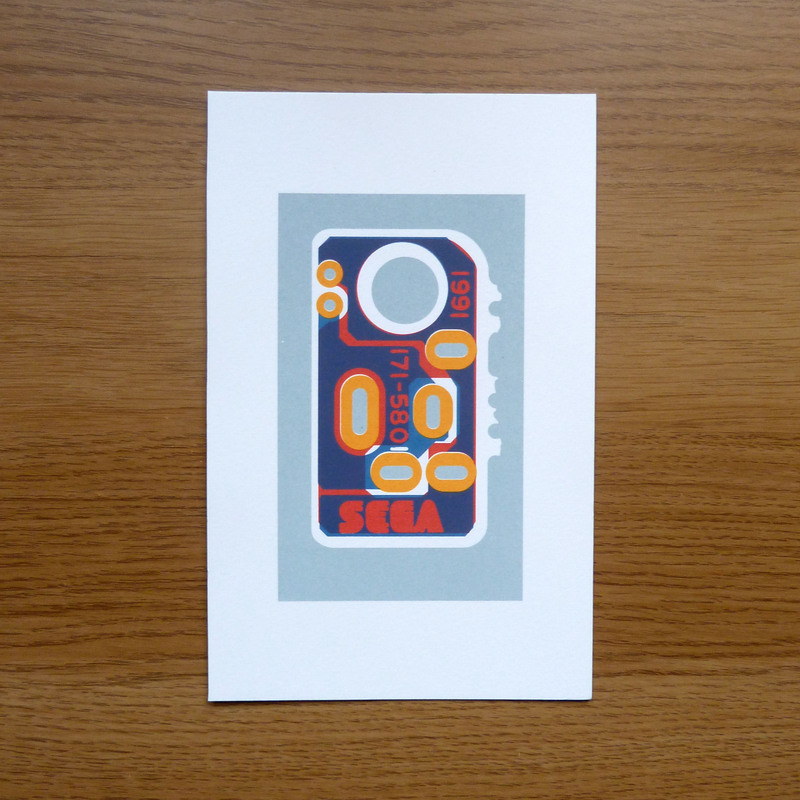 The result is some new Sinclair ZX Spectrum Issue One prints, and as of this weekend, some Nintendo Gameboy prints too! Last of all, I changed the shop to be called simply “circuit portraits”, and switched the domains over. http://blog.circuitportraits.com, and then http://www.circuitportraits.com leads to the shop. I was honoured to be invited to be part of a small group show at St Margaret’s House over the run up to Christmas, and decided to make this the formal launch for the Circuit Portraits project. 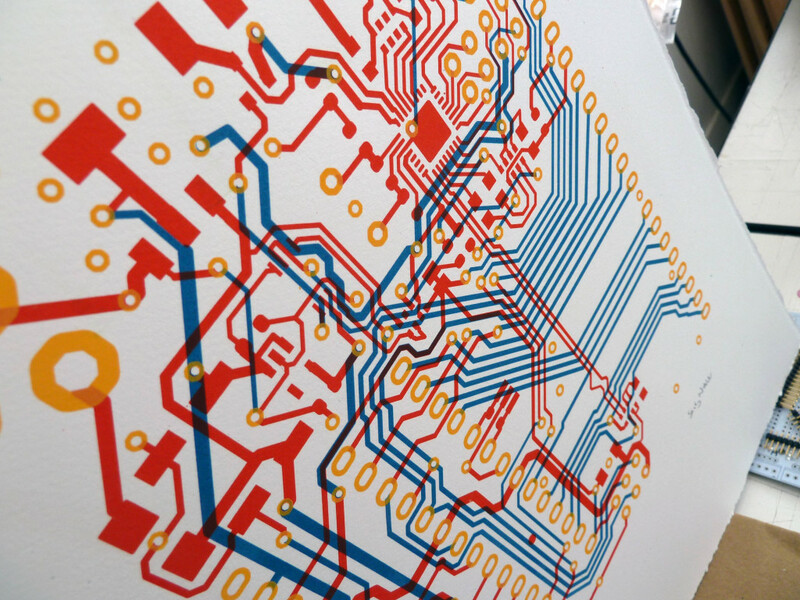 It coincides with the first showing of the biggest circuit portrait so far: The mighty Commodore 64 that you can read about on the Print Justice blog. The show is open in Gallery 3 from 2pm on 12th of December, and running until the 20th of December. Drop me a note if you’re thinking about coming along and I can come and chat! Well, if you want me to anyway. Monochromatic ZX Spectrum and sunset ZX81 are now available on Etsy! Good price, you buy! 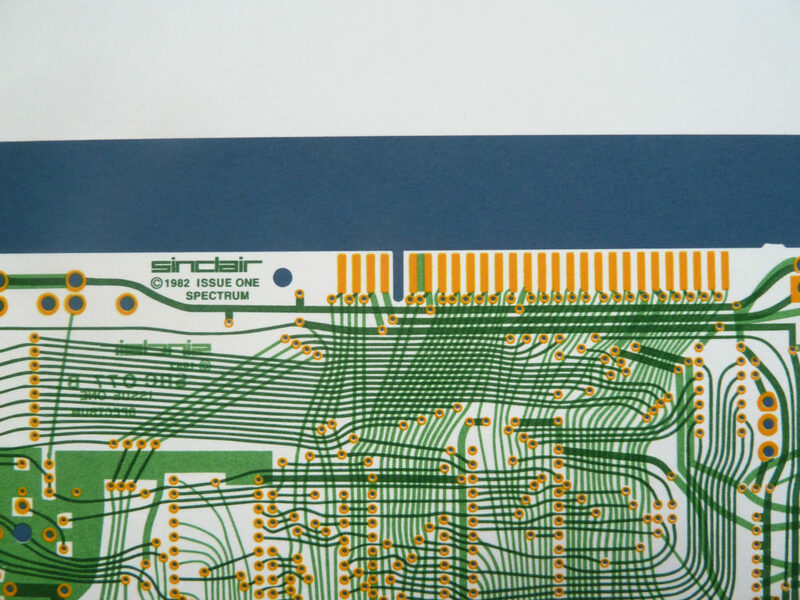 I’ve been in the printshop today, started off printing an edition of sombre ZX81s … but ruined the emulsion on the final layer by pulling some tape off too fast. Duh. So I’ll re-expose tomorrow and finish this off. 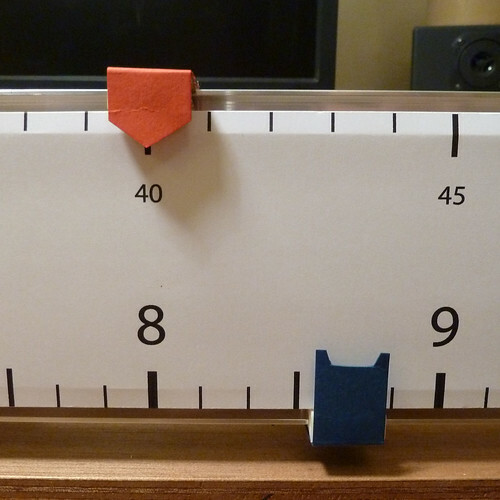 Chris Farnell (@mindofchris) interviewed me about my linear clock for Hack Circus magazine earlier this year, and it went up on their blog recently. Time in a straight line. Though I was a bit cross to see Philomena Cunk ripping off my riff in Screenwipe recently. 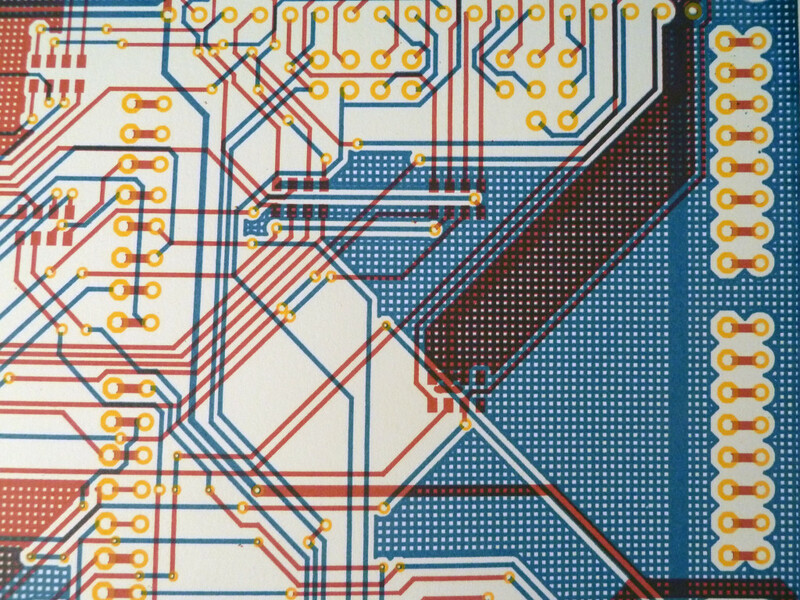 I spent a day in the printmakers workshop again, and came out with some new circuit portraits – this time the design is taken from the EAGLE source of the Arduino(tm) Uno R3. Available from my Etsy shop, for a very good price. You’re right, I _would_ say that. 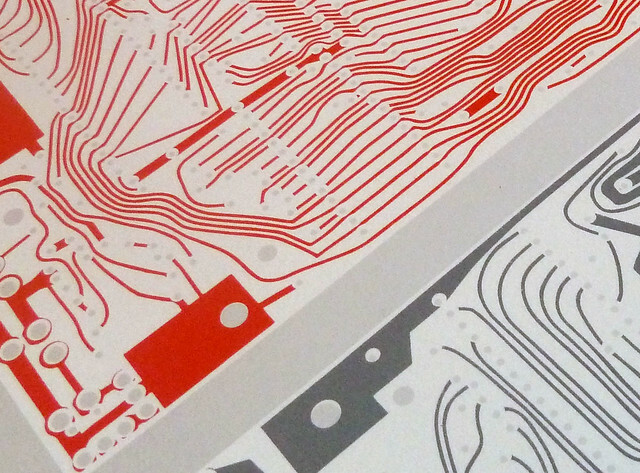 I had the opportunity to do some screen printing recently, and it was brilliant, I loved it. This is the first step into a new project that I haven’t quite thought of a catchy name for yet: Circuit portraits. 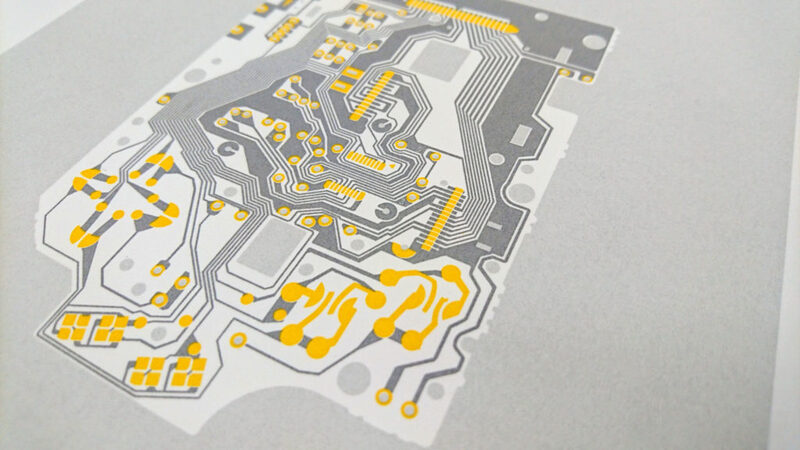 This is an effort to look past the utility of a printed circuit board, and revel in the unsung beauty of the physical design itself. I find the patterns and shapes that arise in the designs to be compelling and evocative. I hope this will become a series of small editions, each exposing the basic engineering of some famous or popular circuit. In a somewhat conceited fashion, I printed my own Polarshield as the first in the series, and in a very limited edition of only five prints, and they are selling already on my Etsy shop. I have a couple of ideas for the follow-ups, but I am happy to take suggestions for subjects – if they make it to the press, then you’ll get a free print from the edition for your idea! Hello, so I’m going to an interesting thing at the beginning of next month. It’s called Hack Circus, and is the first of a series of small events putting clever and creative people together to discuss funny things. For some reason, the organisers (Final Bullet – featuring my old pal Leila Johnston) think that I am good company for them. This is just a wee one. I am not going to complain about this flattering association, and since I am currently working on a new prototype of my famous linear clock, and the theme of the evening is Time Travel, I will be travelling with it, and showing it off and talking about it on Sunday October 6th, 2013, between 2 and 6pm. I will probably go on about clocks, making this clock, happy faces, sad faces, time and special times. Hopefully it will be more exciting that it sounds, but don’t bet on it. 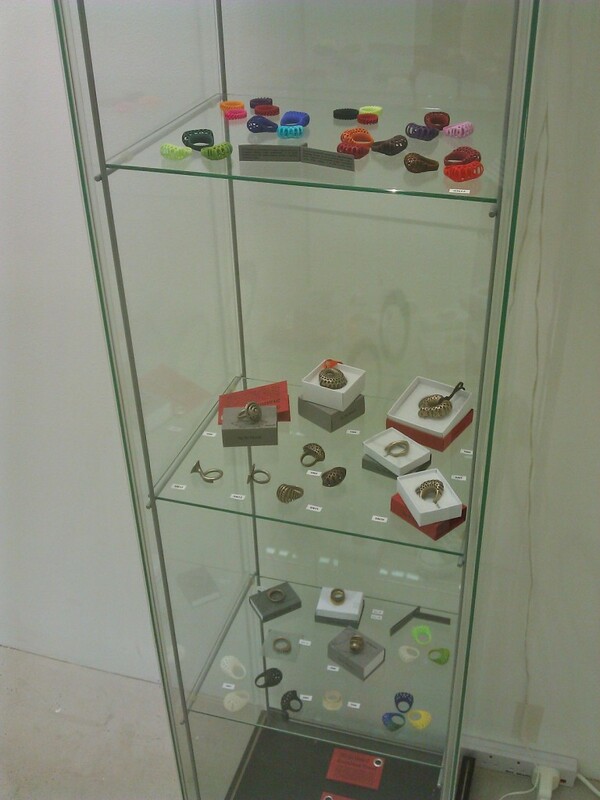 I have some nice gear in the Arts Complex tenant’s show, which is on throughout August 2013 here in Edinburgh. There is also lots of other nice stuff in the show! Arts Complex is a big 60s office building here in Meadowbank in Edinburgh, that was forsaken by business and converted into workshops, studios and galleries. I’ve got a little studio there where I make all my Polargraph things, and basically anything that doesn’t fit in the flat. 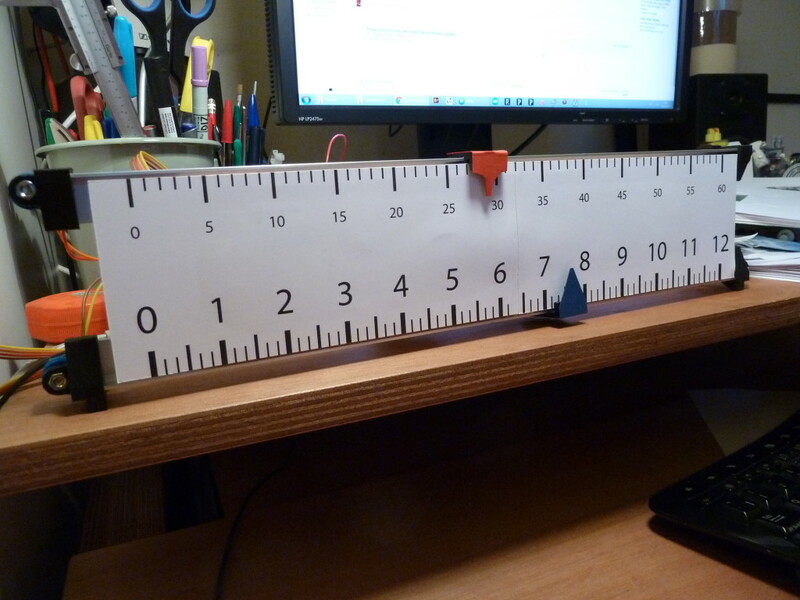 I posted about this on the polargraph blog too. Come along for a look!